■ Laparoscopic renal cyst ablation is a minimally invasive technique that can be offered to patients who suffer from symptomatic simple renal cysts and who have failed previous conservative management and a trial of percutaneous drainage. ■ In patients with symptomatic peripelvic renal cysts, overzealous attempts at complete cyst wall excision should be avoided. Only a portion of the exposed cyst wall should be removed with meticulous dissection used to prevent injury to hilar structures. Fixation of perirenal fat or omentum within the cyst cavity can aid in preventing cyst fluid reaccumulation and recurrence. ■ Complete exposure and mobilization of kidneys in autosomal dominant polycystic kidney disease patients suffering from painful cysts are necessary to identify and ablate as many cysts as possible. 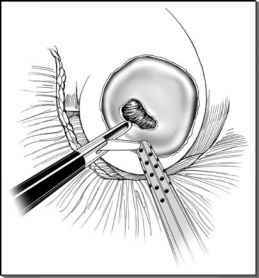 Use of an intraoperative laparoscopic ultrasound probe can help identify and treat deep-seated cysts. Simultaneous bilateral renal cyst ablation should be performed when possible in patients presenting with bilateral symptoms. ■ Preoperative placement of a ureteral catheter with retrograde injection of dyed saline in complex renal cyst cases such as peripelvic cysts and autosomal dominant polycystic kidney disease can help identify the precise location of collecting system injuries and facilitate their repair. ■ Cytologic analysis of aspirated cyst fluid and histopathologic analysis of intraoperative biopsies of suspicious areas within the cyst cavity should be performed, especially in cases of indeterminate renal cystic lesions (e.g., Bosniak class II and III), to rule out malignancy.